Price: Normally $20.90, for a limited time it's only $9.95! The perfect gift for yourself and any photo enthusiasts you know! These two CheatSheets are perfect for understanding digital cameras. "A Great way to learn the secrets of your Digital Camera!" 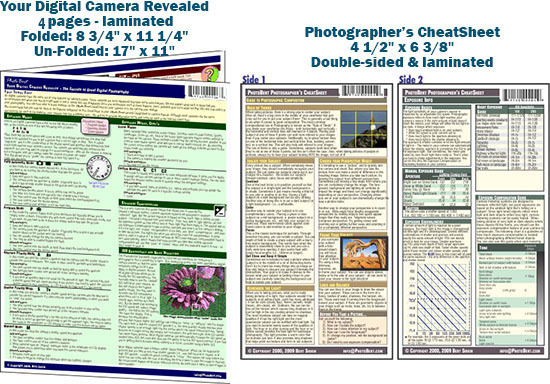 These two one-of-a-kind CheatSheets provide the information critical to understanding digital cameras. Our "Your Digital Camera Revealed" CheatSheet describes the most important features that all modern digital cameras have, and that you need to understand to make the most of your camera and take the best pictures. It's 5 pages of what you need to know!. This CheatSheet is a practical, no-nonsense guide to learning the basics of your digital camera. It contains a wealth of information on the subject of Photography presented in an easy to understand manner. There is no easier way to learn the secrets!